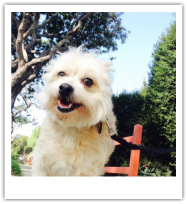 We are proud to be one of the TOP TEN DOG WALKERS IN WEST HOLLYWOOD! We are Yelp Award Winners. Please check out our 5 star reviews here and scroll down for more. Thank you so much for taking care of Isaboo, Jeremy! You did a fantastic job! Jeremy! 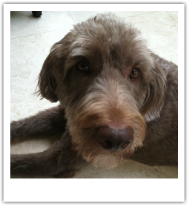 A HUGE thank you for looking after Maddie & Brady while we were away for Thanksgiving! They were so happy to see us come home, but I think they were a little bummed because they stopped and stared at the door a few times after we arrived...probably wondering if you were coming back too. Ha! --Clayton E.
Jeremy is the best! He is a really nice guy who loves and understands animals. He walks our two girls and they LOVE him! We were having a lot of problems with our one dog pulling and jumping at people and he has been working with her for a few months now and she has improved 100%! She will now walk at your side, stop when you stop, etc.... It has been a transformation to say the least. I cannot recommend Jeremy enough! He is the best! --Carina L.
Jeremy of WEHOunds has been amazing with our Tootie! He's very professional, and has gone the extra mile (so to speak) to really care for Tootie on every walk and he even takes pix of her while they walk! I couldn't ask for anyone more reliable or responsible walking our little girl. Thanks, Jeremy! --Ann G.
I can't say enough good things about Jeremy and Wehounds! 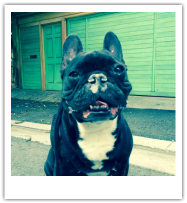 Jeremy has been walking our french bulldog every week day for about a year and half and is hands down the best dog walker we've ever had. He is responsible, is the only one who can get Napoleon to really walk, and Napoleon actually has fun walking with Jeremy (which is rare because Napoleon is a bit stubborn and lazy). On a daily basis, Jeremy sends us pictures or videos of his walks that are humorous and gorgeous (seriously, the pictures could be framed). They are a highlight of my day! Also, I know he takes incredibly good care of Napoleon. One day, Napoleon broke a nail on one of my daughter's toys and was bleeding profusely. Jeremy made a paste out of flour and water and applied it to stop the bleeding, then cleaned my rug so it was spotless. I returned home to a dog that was happy, healing and absolutely no mess. Additionally, my husband and I recently went out of town and before we left, we noticed Napoleon's eye was a bit glassy (actually, Jeremy was the first to notice it). I was worried about putting Napoleon at his regular boarding place, so we asked Jeremy to stay with him. I'm so glad we did! We loved getting the daily pictures and we returned home to an adorable "report card" about Napoleon's "sleepover." It was wonderful (and as an aside, Jeremy took the time to wash the sheets and remake the bed before we got home which I really appreciated). And Napoleon seems less traumatized with our leaving that when we've picked him up from boarding. I truly can't say enough wonderful things about Jeremy. I am so grateful for the care he gives Napoleon and I wish that everyone made my life as easy as Jeremy does. He is a rare find in this city and I can't recommend him and Wehounds highly enough! --Julie M.
Jeremy is the best! He and his team are so reliable, caring, responsible and flexible - they go above and beyond! We always know our kitty will be well-taken care of when we're out of town, and really appreciate the daily check-ins and photos. So happy we found Jeremy and highly recommend him! -- Laura C.
I'm pretty sure the best part of Choco's day is when you come over! He's totally in love with you...I honestly never see him act this way. --Gabi B.
I was recommended WeHounds by friends who have used them for a long time. With that, I had high expectations. I have two senior small dogs, one of which is blind. WeHounds exceeded my expectations. Jeremy was extremely professional from the first meet and greet. My boys were very comfortable with him from the start. The first time we used him was for a three day overnight stay. My blind dog can get restless when outside his normal surroundings or around people he doesn't know. 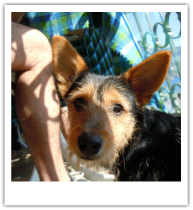 Jeremy had no problems with both my dogs and was kind enough to send regular updates including photos of their outings. And since he was staying at our place, he was a very respectful houseguest (more than he needed to be). Thank you WeHounds. 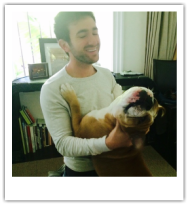 --Chris A.
I moved to West Hollywood about a year ago and was very nervous because I could not find anybody with whom I would want my dog to spend his time with after having my dog leave his previous dog walker who did not work in West Hollywood. I searched on yelp and I found Jeremy. It warms my heart to find somebody as caring and trustworthy as Jeremy who truly and genuinely cares about animals and not just says he does but really really really does. Jeremy Is reliable and trustworthy and goes above and beyond his duties. Due to his quick thinking and smarts, he saved my house from a potentially severe flood when one of my cats decided to run a bath in the middle of the day. I never have to worry about my animals when Jeremy is with them and I look forward to his daily pictures. Please if you're reading this, I can assure you that Jeremy is truly the best there is. When Jeremy is unable to walk my dog, which is hardly ever, he makes sure that my dog is walked by one of his WeHounds dog walkers and it has always been stress free. Thank you Jeremy and WeHounds for making my animals happy and for making me go to work knowing that they're going to be taken care of. --Sasha M.
Well, this picture pretty much sums it up. Carmine is in ecstasy when Jeremy comes over. Jeremy has a great way with dogs; he's very friendly and easy-going. He's professional, communicative, and kind. He's taken care of Carmine on and off for years (when we both lived in New York) and there's nobody that I trust more to take care of my boy. --Jon G.
WeHounds is the only way to go if you're looking for a dog walker! I looked for so long for a dog walker that I was comfortable with, but when I found WeHounds I knew it was the one. The owner of the company, Jeremy, is trustworthy, knowledgable, and so kind, and he has put together a group of dog walkers that I trust and love. When we first started with WeHounds, Jeremy came over to meet us before he started walking our dog regularly. He tailored the whole experience to what we need, and every day that they come I am happy knowing that Vinnie is well taken care of. Communication is open and clear, and they are always prompt to respond and flexible with our schedule. 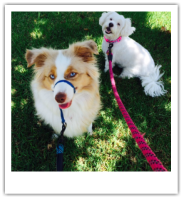 They are more that just dog walkers, they are trained professionals that always put our dog's safety and needs first. Our Vinnie LOVES it when they come to walk and play with him. I also LOVE the daily pictures they send from the walks around Hollywood. If you are considering a dog walker, there is no one else I would recommend! Thank you WeHounds! --Ashley A.
Dear Jeremy, Thank you so much for taking GREAT care of Fergie and Sofia this past week. We're normally reluctant to leave town because we worry about them so much, but the pictures you sent us made us feel a lot better. It looks like you guys had a blast, and the pups didn't miss us at all. Kinda hurts. ; ) --Bruce B.
Jeremy and his team at WeHounds are the absolute best. My dogs are chihuahuas and can be VERY discerning haha. They love Jeremy so much and look forward to him coming to walk them every day. Incredibly professional, fair with cancellations amid the hustle and bustle of work/life balance in Los Angeles. He makes my life so much easier and I never have any anxiety knowing my pups are well taken care of. -- Corey S.
You make it very easy for us, Jeremy! [Buddy] is a bit more timid, so I think he responds to your calmness and sensitivity. Thank you for taking your time with him. He enjoys the companionship, and we certainly appreciate having your help. --Barbara D.
WeHounds rocked! They took excellent care of my girl while I was working crazy house for a few months. We were in constant communication and I always felt safe with them. Highly recommended! --Cathy L.
Samson loves his walks with Jeremy. He's normally so high energy, but I can tell when I get home that he's had a big work out. It's great to be able to come home and just relax together. Thank you!!! --Brice C.